Is Expansion on the horizon? Looking for a Midwest presence? Consider the advantages of the strategic location of our region. Located in the St. Louis IL-MO MSA, businesses in our region enjoy nationwide access. Our optimal location provides quick and efficient transport to the rest of the country and ease in attracting a large pool of skilled workers. An ideal setting for companies requiring an affordable, centrally located geographic location, our region is home to all four key modes of transportation including air, rail, road, and water, a rare find among metropolitan areas. Here are more specifics on why our region’s location is so strategic. Located within 500 miles of one third of the nation’s population. 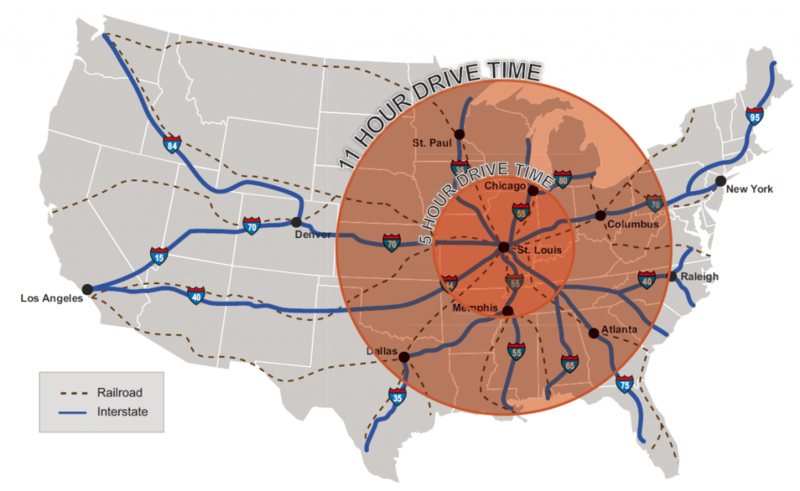 Within one-day truck drive of 30% of U.S. population. A one-day or less truck drive to and from Chicago, Memphis, Nashville, Kansas City, Columbus, Atlanta, Dallas, Cleveland, Minneapolis/St.Paul, and New Orleans. I-255 / 55 / 64 / 70, Illinois Route 3, Illinois Route 158, and U.S. Route 50. Lack of congestion in the region makes rapid turnaround for freight as it travels in and out of our region. Approximately four hours or less to fly from nearly everywhere in the continental United States. Kaskaskia Regional Port, America’s Central Port, Port of Metropolitan St. Louis, and St. Louis Port Authority. Six of the seven class 1 railroads converge in the St. Louis Region. Union Pacific Railway runs right through our service area and allows for efficient transportation through 23 different states. Conveniently located in a populous MSA with a large pool of skilled workers to draw from. We are a pro-business region with plenty of suitable sites for your company’s next expansion. Contact Edie Koch at ekoch@mciledc.com for more information and/or assistance in your site selection.